The first step is getting very clear on what your intentions are by carving out a niche or a particular target market that you want to establish as your clientele. No one person, particularly early on, can be the solution for everybody or everybody’s problems, so get clear on who and what you really want to go after and then learn everything you can about their needs. The second part of this equation is to then figure out a solution to your niche’s issues so that you are clear where your value lies for others. So, to highlight this advice, I can tell you about a past client named Nancy who had started her own business as a Financial Advisor. She wasn’t sure early on what her target market would be as she wanted to be open to a diverse roster of clientele. As a result she was never clear in her marketing and advertising efforts what value she was bringing to her clients that was any different from her much larger and more established competitors. She and I worked on identifying her ideal target market which was 30 something newlyweds. Next, I made sure that she was focusing her own learning and development around becoming an expert advisor around some of the universal issues that arise for newlyweds as it relates to their financial management. The next step was having Nancy work on creating products and services that would easily and efficiently meet the needs of these ideal clients. Within a year, Nancy was enjoying a 60% increase in her revenues as a result of these actions. Thought leader Simon Sinek has written a book entitled, ‘Start with Why’ which explains that the most salient way to differentiate yourself from your competitors and rise to the top is to communicate your, “What, How and Why” when pitching your business. Sinek explains that our “What” is merely the title on our business card, so in my case, Leadership Coach and Consultant. Our “How” explains how we accomplish our overall work intention. So in my case again, my “How” is that I listen and respond dynamically to my clients based on my experience as a psychotherapist, a corporate sales management trainer and now as an entrepreneur. But most important, Sinek explains, is to crisply and evocatively express your “Why” when pitching yourself or your business. One’s ‘Why’ is our highest intention driving the work that we do and explains to others our core motivation. So for example, my why is to alleviate pain by igniting and emboldening women to become more inspired, effective business leaders. Once you are clear on “Your What, your How and Your Why”, begin your conversations with these messages rather than a contrived and uncomfortable sales pitch. I guarantee that as a result you will spark intrigue in the right parties and the business will follow. Ask & Close for Their Business/Commitment based on their social style. Throughout your interactions with a potential client, be sure to ask the right questions that will shed light on their decision making process, their value system as well as their social style. The 4 universal social styles are analytical, driver, amiable and expressive. Be sure to adapt your approach and focus with each person based on their social style. So for example, if you are dealing with someone who is ‘analytical’, you want to be sure to have data proving your ROI or contextual information that you can present to them so that they can make their own informed decision as to whether or not they want to work with you or not. If they are a ‘driver’, then focus your pitch on how you will help them achieve their goals in the most efficient manner and be forthright with asking them for their business. However, if they are ‘amiable’ , you want to be purely relationship focused and let the business follow from there. With ‘expressives’, sit back and let them talk and be sure to listen to what they are telling you they need and use more of a soft close with both the’ amiables’ and the ‘expressives’. 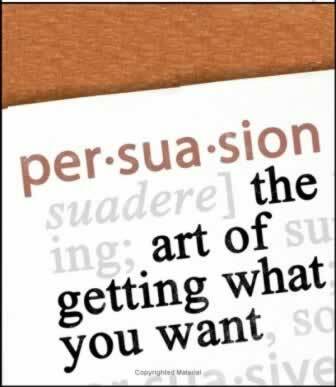 It should go without saying, but your success rate in persuading others will only be as good as the work that you are producing elsewhere. Particularly when you are embarking on a new niche or a new target market, I urge you to deliver 110% on the small windows of opportunity that you are given and to follow-up with an evaluation process so that you can perfect your work. This is even more critical if you live in a small city like Portland where there seems to always be six degrees of separation amongst your colleagues. Throughout this process that I am describing, you are developing your expert status that will over time build your credibility and authority and in turn lead to a very high rate of persuasion. However, keep in mind that this journey takes time in order to build your reputation properly. That being said, you want to be sure to start slow and small and begin to take on larger projects and/or complexity of clientele’s issues gradually. With each win, meaning successful work relationships, figure out a way to share that success with your larger community and network as well as potential new clients. Some examples of this would be to write an article or a blog about your success with your client (not disclosing their identity unless you received permission from them of course), sharing your lessons learned on social media or seeking out opportunities to speak publicly or on a panel to your target market. This entry was posted on Tuesday, September 27th, 2011 at 9:11 am and is filed under Attracting Clients, Building Your Brand. You can follow any responses to this entry through the RSS 2.0 feed. You can leave a response, or trackback from your own site.